In this section we will discuss the aspects of a properly setup crab cage or "crabitat" as it is commonly called. As mentioned throughout this site our approach is to attempt to simulate conditions that hermit crabs would find in nature. In regards to th e crabitat this means you need to have a sandy / soil mixture deep enough that your largest crab can bury under ground for extended periods while they molt. Your crabitat should be tall enough to accommodate the necessary depth of sand for burying and still allow enough room for living space. Beware there are 2 different types of glass tanks; aquariums and terrariums. Aquariums are designed to be filled with water, so obtaining the proper sand depth is no problem. Terrariums on the other hand, use a thinner glass and are rated for only partial water. Check with the manufacturer to see if your tank can safely hold the proper amount of sand. It would be a disaster if the bottom or sides broke while you were using it. 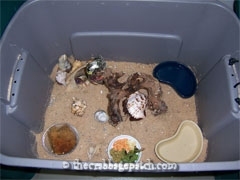 Your crabitat should have room enough for 2 water dishes, 1 food dish, a hut, something to climb on and area to live in. Your crabitat needs to have a lid on it so that no one can escape. Hermit crabs are escape artists. The small crabs can climb right up the silicone in the corners of a tank. The area you keep your crabitat in needs to remain at a fairly warm temperature (78deg. F is ideal). Cool temperatures cause the crabs to be less active. Excessive temperatures can result in overheating and death. Keep the tank out of any air conditioner draft. If keeping it outside during the summer make sure it remains out of direct sunlight. Hermit crabs are not basking creatures like many reptiles. If offered the choice between sun and shade, hermit crabs will always pick the shade. If you feel you need to add auxiliary heat in the winter use a nocturnal bulb or ceramic heater over one portion of the cage. Make sure the crabs can get out of the heat if it is too warm for them. It is always a good idea to put a thermal rheostat on the heater that turns it off when the cage reaches the right temperature. 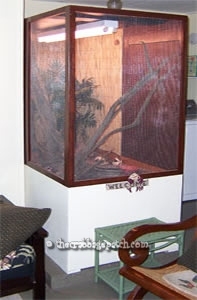 Try to keep your cage at a humidity of around 60 - 80%. Saturated natural sponges, humidifiers and misting with non-chlorinated water are all good ways to increase the humidity. It is always a good idea to put your crabitat in a location where it will be noticed and not forgotten. This way you will be apt to play with your crabs more often and they will begin to trust you faster. Hermit crabs are nocturnal and can be quite active and rowdy at night. Putting the cage in your bedroom can be fun or a nuisance depending on your sleep habits. 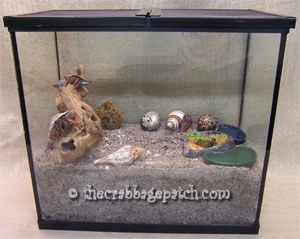 When choosing a location for your cage be aware that hermit crabs are vulnerable to anything sprayed around their environment such as hair spray, cologne, room deodorizer and pest control sprays.